Mata Hinglaj Reception: This is what greets one upon arriving at Mata Hinglaj. The main temples are from 15 minutes to 45 minutes walk from here.. 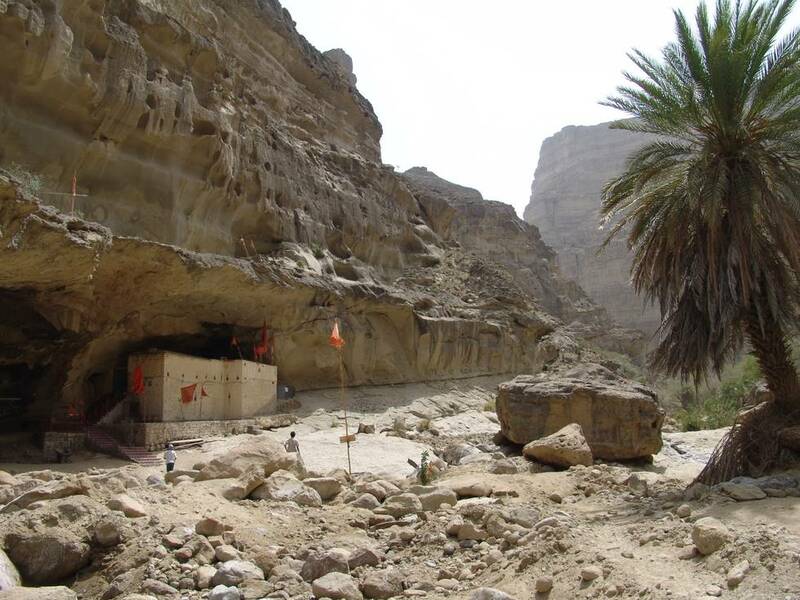 The temple of the goddess [Hinglaj] is a Hindu shrine located within the huge Hingol National Park of Balochistan which lies along the Makran coast in the Lyari district of Balochistan province. Legend has it that when goddess Sati, the consort of god Shiva burnt herself in response to her father’s anger at her for not inviting Shiva to a ceremony, Shiva became furious and started to create disasters, problems, violence, and sufferings in the world. In order to calm his anger, god Vishnu took the body of Sati and began to cut it into 51 pieces where they all fell at different parts of the earth. 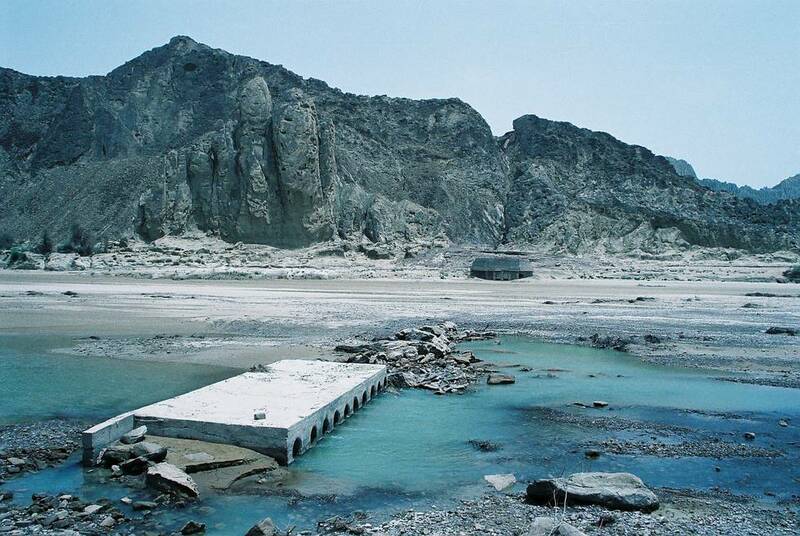 Hindus believe that the head of Sati fell in the area of Hinglaj Mata in Balochistan, Pakistan. Approaching the temple: The walk to the temple is through a rocky and mostly dry river bed. Thus, this area is very significant in the Hindu faith and a revered pilgrimage site. Hinglaj was the prime pilgrimage site for the Hindus of India until the partition of 1947 when Indians lost access to this cultural heritage, as it was now bounded by Pakistan. Higlaj wasn’t just the only Indian site for worship, there were many other such locations in Pakistan that were worship spots for the Hindus, but the rage of politics destroyed many such cultural heritage to turn these worship spots into abandoned dilapidated ramshackle premises. Such spots were Lakhi, the Phuleli site for Jhule-lal, and the Prahlad-Aditya temple in Multan. Mata Hinglaj Reception: This is what greets one upon arriving at Mata Hinglaj. The main temples are from 15 minutes to 45 minutes walk from here. One may still wonder, if that was the case then how come Hinglaj has still continued to be a famous pilgrimage. The reason lies in humanity displayed by the people of Balochistan. The handful of Hindu residents who still live in Pakistan wouldn’t have resisted the wave of demolition by extremists had it not been the Muslim residents of Balochistan who stood firm to protect this ancient holy asset of historical glory. It would be sheer discrimination if we call Hinglaj solely as a Hindu pilgrimage site. The fact is that Muslims equally revere this place and come to pray over here, they call it “Nani-Ka-Haj” which means “Pilgrimage to Grandmother’s Shrine”. Each year a grand cultural-fair is organized at the temple. Muslim residents actively take part in this celebration. They pray here with the same devotion as they do in the mosque. As for the offerings they carry mostly a red cloth, attar (perfume) and agarbattis (Incense Sticks).While in shrine, it’s sometime impossible to predict whether it’s a Hindu temple or a Muslim mosque. That’s the situation here in India too where the people from all the religions jointly celebrate all Indian festivals with a great pomp. Pilgrims come from all over Pakistan, carrying red banners and wearing decorative red-and-gold head-scarves or saffron headbands that signify the holy colours of Hinglaj Mata. Hinglaj is the first of 56 shakti peeths and its mentioned in Durga saptshati and Markand Puarn. Its about 170 miles (250 KM) from Karachi. The last shakti peeth is Kamakhya in Assam and there are shakti peeths in Bangladesh as well. The Founder of Sikh dharma, Baba Guru Nanak Dev too, visited Hinglaj in one of 4 udasis. 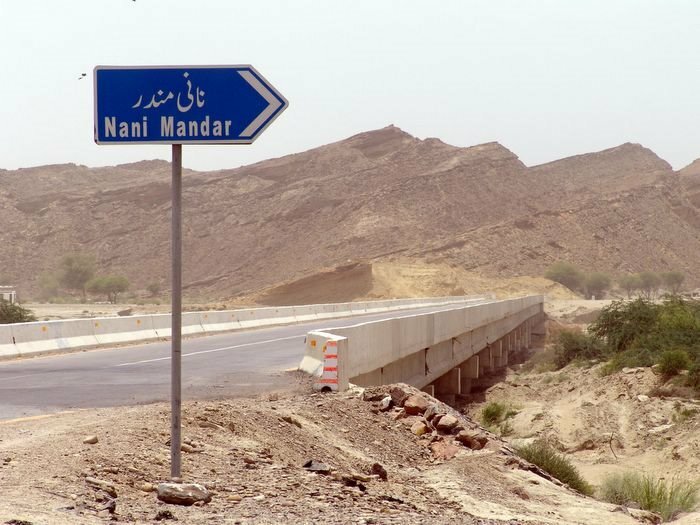 To reach Hinglaj Mata – one has to go by road on the main Karachi-Quetta Highway upto Zero Point for about 75 miles and then by road towards west through Lyari town and then to Signal Fauji Camp Stop, crossing Aghore River, then through Goongi River and last stop to “Asha Pura” Sarai or Asha Pura Inn. There are worship places of Ganesh Deva, Mata Kali, Guru Gorakh Nath Dooni, Braham Kudh, Tir Kundh, Guru Nanak Kharao, Ram jharokha, Bethak, Aneel Kundh on Chorasi Mountain, Chandra Goop, Khari river, Aghore and the principal pilgrimage site the Asthan of Mata Hinglaj. Pilgrims from all over Pakistan, carrying red banners; wearing decorative red-and-gold head-scarves or saffron headbands that signify the holy colours of Hinglaj Mata, throng the holy place in March / April of every year. The climax of the four-day pilgrimage comes on the third day when high priests chant mantras, inviting gods to accept the offerings of the devotees and bring them peace and plenty. Visit to Hinglaj Asthan, once an arduous journey of more than 150km (93 miles) through the desert from the nearest road, the shrine is now easily accessible through the newly built coastal highway. 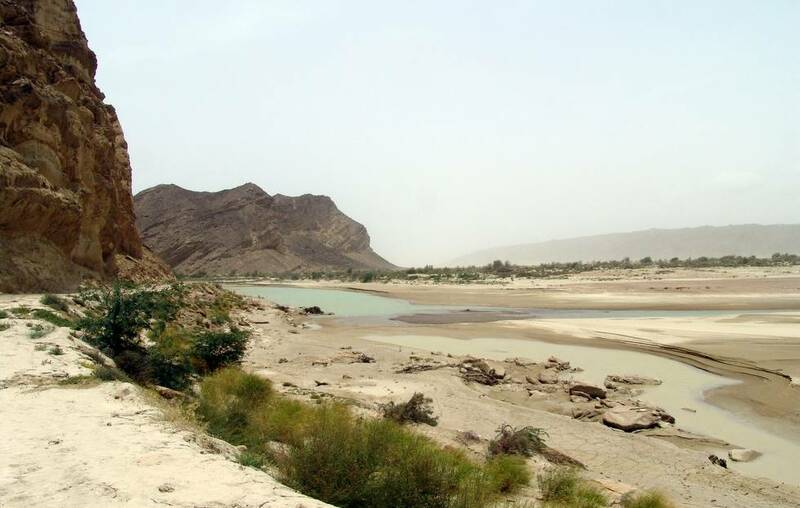 Hingol River: A view of the Hingol river from the track to Nani Mandar. Before partition, more than 20% of the population of today’s Pakistan was Hindu, but most of them migrated to India at the time of partition in 1947. Today, there are roughly three million Hindus in Pakistan, or about 1.6% of the total. Mostly the Hindu community in Pakistan is concentrated around the Thar, a south-eastern district of Sindh province of Pakistan. Thar houses more than 2.3 million Hindus, the largest Hindu population in a single district outside India. There are some traders and government employees among them, but the majority are farm workers and labourers. With their heavily embroidered clothes and wrists packed with bangles, Thari Hindus clearly dominate the Hinglaj pilgrimage in terms of numbers. 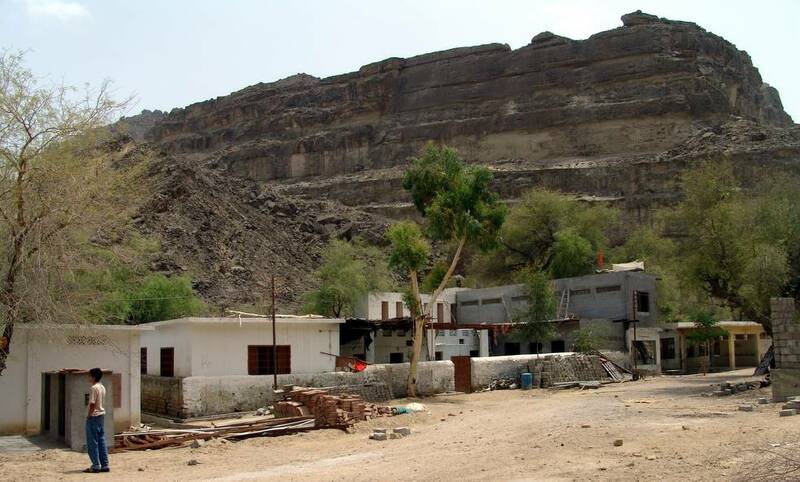 Balochistan province is also home to a large number of Hindus, and the local Muslim population has traditionally venerated and protected Hindu sites, such as the temple of Hinglaj Mata. A highlight of the Hinglaj pilgrimage this year was a group of Balochistani Hindu priests collecting donations for a Hindu temple being built in Quetta, the provincial capital. Crossing the Hingol river en route to Hinglaj. The pilgrimage including paying a homage to Hinglaj Mata is celebrated every year with full fervour and devotion. The ceremony lasts for four days. During these celebrations, the mountain desert around Hinglaj turns into an oasis of hospitality. Hundreds of volunteers help with a range of activities such as regulating the parking of hundreds of buses, jeeps, cars and trolleys, arranging water for the pilgrims, operating electricity generators and running the kitchen where tons of wheat flour, rice, lentils and vegetables are cooked three times a day to feed the pilgrims. All adults pay 650 rupees per head to finance this activity. While a huge majority of the pilgrims are lower class labourers from rural Pakistan, some middle-class families from Karachi also make the annual pilgrimage. 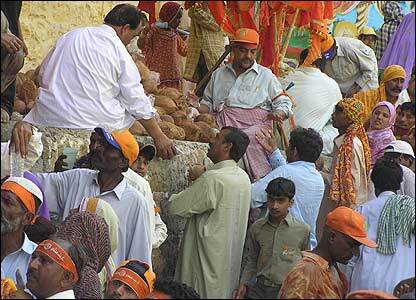 Karachi is home to about 70,000 Hindus and is the first stop of the pilgrims on their way to Hinglaj. Some come only for a day. Others stay on for all the four days, sleeping under the open sky and queuing up outside some 50 makeshift bathrooms each morning. Even children have great fun here – especially the Thari children who remain confined to agricultural farms where many of them work as bonded labour the whole year round. Given their precarious social position, many of them would never be able to return to Hinglaj for a long time, but they can cherish the memory. For any Kutchhi Hindu, a visit to Hinglaj Temple is the ultimate pilgrimage. In ancient times, a person who returned safely after completing the trip [because then the temple was located in a dense forest ] was not cremated, but buried and worshipped as a deity. Given the holiness of the place in Hinduism, one would expect that every Kutchhi at least, true to his faith, would take this pilgrimage, especially now that with technology and infrastructure, the temple is accessible. But, hardly does any Kutchhi travel there as the temple is located in Baluchistan, 280 km from Karachi in Pakistan. With misconceptions, fear and suspicion rife about the neighbouring country, very few like to take the challenge. Among those few is a group of four led by Kishore Chauhan, an adventure tourist, who is also the president of youth hostel in Kutchh and a sadhu from Vandhai village. This group ventured to Hinglaj via Munabao in Rajasthan on May 7. To their surprise, their trepidation had been baseless as they were welcomed with warmth by Pakistani locals as well as authorities. Overwhelmed, Chauhan has now taken it upon himself to help the Kutchhis take the trip to Pakistan for the holy pilgrimage. “I would like to encourage as many pilgrims to visit Hinglaj Mataji temple as I can. I am ready to provide all necessary guidance to anybody who wants to take the challenge,” says Chauhan. @Pandit Satish, Thanks for your visit to this site. Let me have latest updates from the concerned offices. Will accordingly revert in due course. To reach Aghor, the starting point to visit the shrine of Hinglaj Mata, buses are available at Inter-City Bus Terminal, Yusuf Goth, Baldia Town, Karachi (9221- 5413837-8, 0322-2319855, 0313-2266992). The fare is about Rs.400 one way and you can go by van as well with the same fare. It leaves from Kalari, Shah Abdul Latif Bhati Road, Juma Mosque, Karachi, Pakistan. I AM FROM INDIA (DHANBAD). I WANT TO ASK: WHEN THIS 4 DAY DARSHAN (MELA) STARTS. IS ANY TOUR AGENCY WHO TAKES CARE ABOUT VISA AND TOUR TO HINGLAJ MATA. @RN Mishra, We put up a good number of posts on Pakistan’s Hindu heritage. I understand you missed these posts. I would recommend you read these first as some of the articles in this series carry not only insightful stories on the shrine of Hinglaj Mata, but also the relevant logistic. In particular I would recommend the one titled, “I too want to go on Hinglaj yatra’. Its in two parts. One part details all the travel agents that operate visits to Hinglaj shrine. Am sorry I’m not in a position to offer you guidance on visa formalities in India, but you will find in the mentioned article contact details of two sources, one in India and the other in the UAE. I hope this will be of some help to you. If you still may face some problem here in Pakistan, please do let me know and I will definitely take up the issue with concerned quarters to help you out in any manner I can. KATAS – A Paradise Lost and a Paradise Regained! Thanks for yours guidance …. 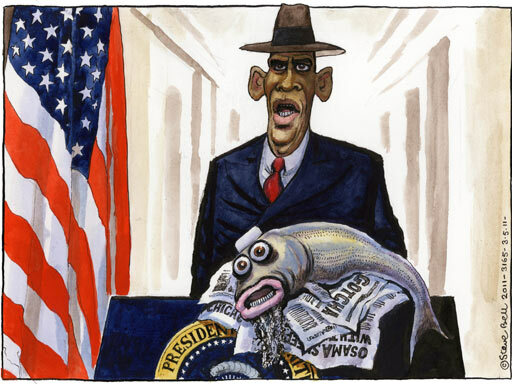 it ll be very helpuf …. Am glad you guys are interested to pay homage to the Holy Hinglaj Mata Ji. But am sorry to inform you that the pilgrimage takes place in the month of April, which obviously has now passed. But you can prepare yourself for next year. We have already mentioned the names of facilitators in Pakistan who furnish complete information about Hinglaj Yatra. You may get all the necessary details mentioned in our post titled ‘I too want to go on Hinglaj Yatra'[in two parts]. In addition, there is a five part series by writer J. Shah again on the Hinglaj pilgrimage. The series is titled, ‘Pilgrimage to Mata Hinglaj (Hingol), Balochistan’. jai mata di to all. i am from bhopal, india (the city of lake). i would like to thank the organiser of this site which enabled me see my goddess mother hinglaj mata ji. nice picture collection n information. thx. @dr. keshar singh solanki, I appreciate your visit and comment. Thank You. @Anil Soneji, Thanx Anil for visiting our WordPress free blog site. To reach Aghor, the starting point to visit the shrine of Hinglaj Mata, buses are available at Inter-City Bus Terminal, Yusuf Goth, Baldia Town, Karachi (9221- 5413837-8, 0322-2319855, 0313-2266992). The fare is about Rs.400 or more one way and you can go by van as well with the same fare. It leaves from Kalari, Shah Abdul Latif Bhati Road, Juma Mosque, Karachi, Pakistan. i like allso all tempuls i wana see it onc’e..
i like allso all tempuls i wana see it onc’e…..
hinglaj mata is the great worship meri mata. ia m really miss u . jai mata. How to share friends, these Views to all. Greetings! I am a Pakistani Muslim and have accidentally bumped into your blog. I have finished reading all your articles and am very impressed with your humane view of us Pakistani’s. I also happened to visit Nani Mandir last week during a office picnic to the nearby kund malir beach. I had no idea it was such an important shrine but I will tell you this there is a strange sense of calmness that which you just cannot ignore as soon as you enter the shrine area. The majestic kheerthar Mountains add aura to the scenery. I reached there in the evening when the chants were reaching there high point and about to conclude and a number of endangered Ibex goats had gathered on the mountain just in front of the temple. Even though the (Muslim) Para Military Guards had told us that no pictures are allowed inside the mandir the Hindu prohits were very friendly and the baba who was the caretaker of the shrine himself asked us to sit beside him and take pictures. He was very friendly and asked us about our journey to kund malir. To all my Hindu friends, I want to say if you can, you must surely visit this place. It used to be a very remote place before the coastal highway was built but now it is easily accessible all year round and the surrounding area scenery is just spell binding. @ Yasser Yousufi, Your impressions on your visit to Nani ka Mandir have been very inspiring. In the bye gone days Pakistan was a beautiful assemblage of mixed up cultures, where everyone lived according to one’s faith and religious/social customs. After the 1980s when first Afghan war was fought and Pakistan became a conduit for all type of logistics and fighting manpower, left such remnants of thhe war who were imbibed in religious fanaticism and were trained apparently to fight for saving the Afghans from Godless Soviets but actually it was a war that was being fought to eliminate the sole opponent of US as a super power. The resultant effect on Afghanistan and an outfall of the war seen in Pakistan was the same Afghan fighters who hailed from different countries and had an extremist make up in their mind process were seeking refuge in the Northern borderlands of Pakistan (FATA). Our government’s national action plan introduced after the Peshawar massacre of innocent children is well in process now. Many successes have been achieved over these renegade extremists but much remains yet to be achieved. We all are ought to fight and eliminate these hyenas who are killing our children, the women and men of Pakistan under the false pretext that they only are the true interpreters and followers of Islam. I pray to Almighty Allah (also with our practical efforts on national level) to root out all remnants of these religious fanatics and let there be a Pakistan which offers peace and security to all Pakistanis irrespective o their faith, their community or their sect. Let there be a Pakistan which our great Quaid had envisaged for us, a Pakistan which is a country of all Pakistanis, no matter which faith they have, which language they speak and which culture they follow. I say Aameen, Aamen, sum Aameen. Thanks for Darshan the places. My pleasure.